Figure 1. Evening Star pattern. 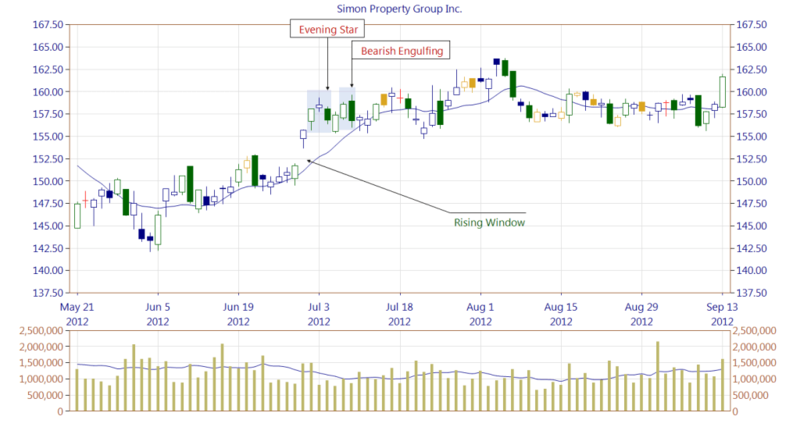 The Evening Star is a three-line bearish reversal pattern appearing in an uptrend. The first line is any white candle appearing as a long line in an uptrend: Long White Candle, White Candle, White Marubozu, Opening White Marubozu, Closing White Marubozu. The second line may be any white or black candle appearing as a short line, except the doji candles. The body of the candle needs to be placed above the prior body, that is the opening and closing price needs to be higher than those of the previous candle. The third line is a black candle appearing as a long line, that is: Long Black Candle, Black Candle, Black Marubozu, Opening Black Marubozu, Closing Black Marubozu. The opening price needs to be located below the prior candle's body. The candle should close at least halfway down the body of the first line. Shadows length or the lack of it do not matter for any pattern line. The second line of the Evening Star may form the One-Candle Shooting Star pattern. First two lines may form the Two-Candle Shooting Star. The Evening Star should be confirmed on the following candles, by breaking the trendline or the nearest support zone, which may be formed by the first line of the pattern. If the pattern is confirmed, its third line may become a resistance zone. When the pattern is not confirmed it may be merely a short pause before further market growth. Figure 2. A Rising Window pattern formed at a high trading volume is followed by an Evening Star pattern and the bears are in control pushing price downward. 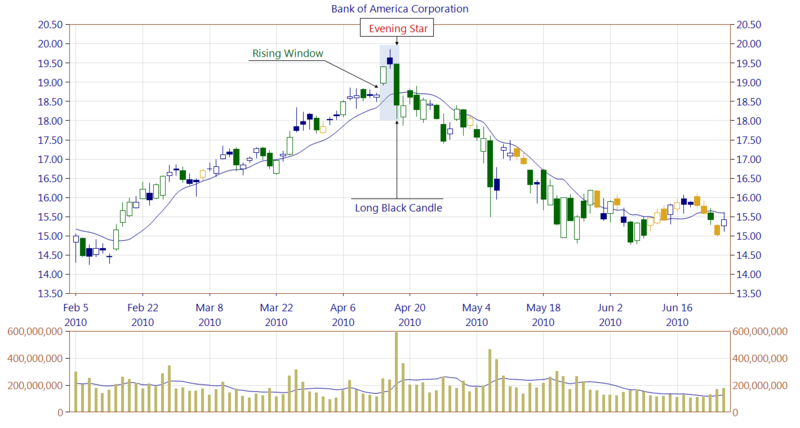 Although theoretically we deal with the Evening Star pattern, a Long Black Candle occurrence itself is the most important candle on the chart in our example. First of all it is formed at an extremely high trading volume, three times greater than the average. Secondly, it has a very long body which distance between the opening and closing price exceeds 5%. And finally the Long Black Candle breaks the trendline, also covering the gap formed by the Rising Window pattern. Long Black Candles very often create resistance zones, which are difficult to break in the future by the bulls. In our example, the Long Black Candle could not be broken for years. Figure 3. A Rising Window is formed at a high trading volume and a strong support zone is created. Then an Evening Star pattern appears. Unfortunately, its first line was built at a high trading volume which strengthens the support area. The second and the third line are created at a lower trading volume. Both, the bulls and the bears may still gain control at this point. Then a Bearish Engulfing pattern appears but the bulls and bears are struggling for control of the market and price moves sideways. 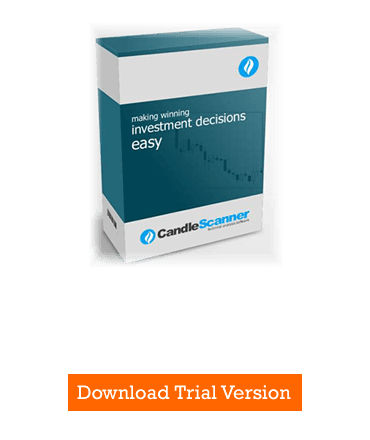 Below you can find some Evening Star pattern statistics calculated by CandleScanner software. To see more detailed statistics, for other markets and periodicity try our CandleScanner software. Prices start at only $10, and you can see more detailed statistics, for other markets and periodicity. Click here to find out more!